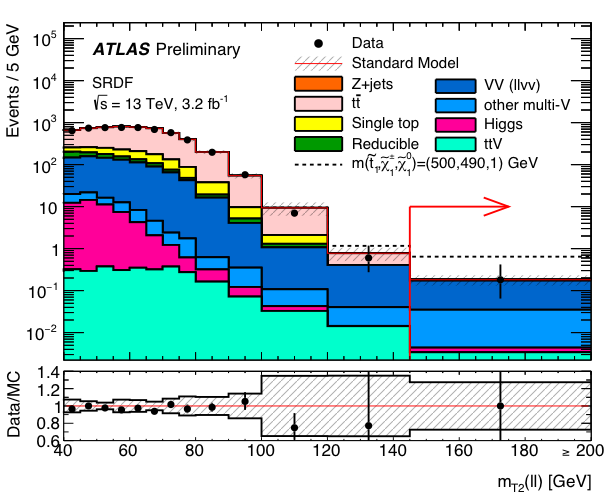 ATLAS data (black points) are compared to the contribution expected from known particles (the filled histograms). The dashed line is the expectation including the contribution from supersymmetric top squark production. According to classical electrodynamics, the electromagnetic energy (and mass) of a point-like electron should be infinite. This is of course not the case! The solution of the riddle is antimatter – the ‘vacuum’ around every electron is filled with a cloud of electrons and anti-electrons and the combined energy turns out to be finite. Likewise, the well-established equations of particle physics lead to an absurdly large value for the Higgs boson mass. The solution of this problem is thought to be the existence of new particles, the lightest of which would make up dark matter – the mysterious, unidentified form of matter that binds galaxies together. Physicists are looking for these supersymmetric particles among those produced in the proton-proton collisions provided by the LHC accelerator. A recent result released by the ATLAS collaboration searched for the top squark, the hypothetical supersymmetric partner of the top quark, which is the heaviest known particle. The top squark would be heavier still and would decay to a lighter quark, a dark matter particle, and an electron or muon. Since the top squark would be produced in pairs in each LHC collision, the physicists have looked for two electrons or muons and missing energy indicating the presence of two invisible dark matter particles. The data, however, are consistent with the events expected from the production of known particles (see figure above). The signal hypothesis shown in the figure is ruled out. Top squarks heavier than about 600 times the proton mass can still escape detection. However, in order for the new particle (if it exists) to provide a solution to the Higgs mass riddle, it shouldn’t be much heavier than about 1000 times the proton mass. As more data will be collected by the LHC experiments in the next few years, ATLAS physicists should be able to tell whether the world is indeed supersymmetric or if the solution to the Higgs mass riddle and the nature of dark matter needs to be found elsewhere.